Walter Stewart’s Market is preparing to expand Stewart’s Spirits in its future home at 215 Elm Street. 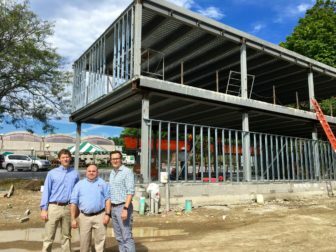 The new Stewart’s Spirits space will be roughly twice as large as the current liquor shop, according to owner Doug Stewart. It will include a full basement, which will make the job easier for Stewart’s Spirits manager John Robinson. The additional space “will allow us to offer even better pricing,” owner Alex Stewart said. It will also allow for expanded selections and improvements that will include a temperature controlled wine case, an expanded beer section and beer cooler, wine cooler space, and regular wine tastings. The additions “are based on customer feedback and industry trends,” he said. The Stewarts will use the current Stewart’s Spirits space to expand their produce section. In the short term, there may be a pop up store that will include holiday-themed products.